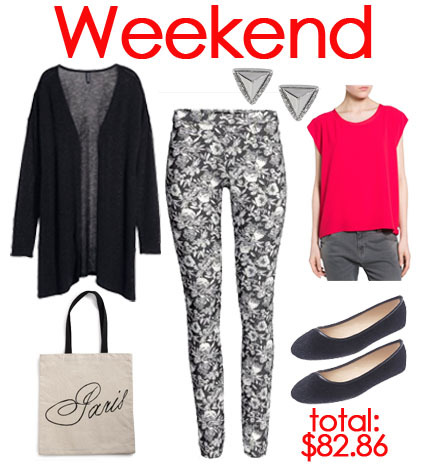 Fabulous in 4 Ways: Floral Leggings for Day, Work, Date, & Weekend (Dedicated to Kristen)! This has been a season of leggings, especially for those us who have been feeling the sweet consequences of the holidays & blizzards in the north-east. However, that’s no reason to get lazy about your style, especially when leggings come in all prints & patterns. Floral leggings are a stylish play on stretchy bottoms & the possibilities of outfits are endless, thanks to my friend, Kristen, who came to me with this idea. In my latest Fabulous in 4 Ways post, instead of styling just one pair of floral leggings, I sought out four must-have & affordable pairs to wear for day, work, date night, & weekend looks. When headed out on daily errands, coffee with the girls, or planning your next dinner party, floral leggings work, allowing for a mixture of textures to enrich your daytime look. SHOP: leggings ($24.99) in multi @Bluefly, sweater ($24.90) in navy / orange @Forever 21, boots ($55.00) in taupe @ALDO, bag ($25.16) @Chic Nova, & stud earrings ($5.00) in gold @Wallis. Depending on your office environment, floral leggings are also a possibility for your work look. When it comes to casual Friday or a business casual dress code, try leggings with a mini dress, boyfriend cardigan, or long blazer. SHOP: leggings ($14.69) @Lord & Taylor, sheath dress ($17.80) in black @Forever 21, ankle booties ($19.97) in grey @Nordstrom Rack, tote ($17.99) in black @Shoptiques, & necklace ($8.74) @Target. When it comes to date night, instead of a classic LBD, try floral leggings with some metallic detail, which instantly dresses up your look. Pairing them with a pop of color & luxe accessories is the perfect way to dress to impress. 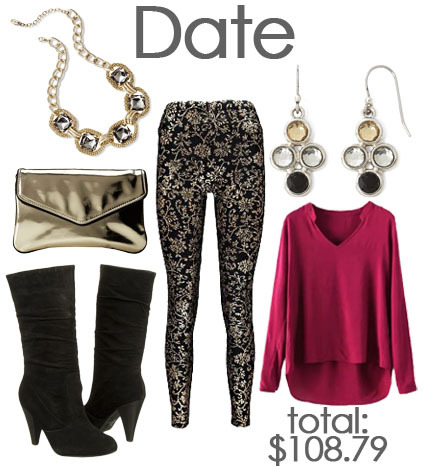 SHOP: leggings ($14.00) @Boohoo, blouse ($28.27) in red @Romwe, boots ($25.99) in black @Shoes.com, clutch ($21.99) in gold @6PM, earrings ($9.80) @JC Penney, & necklace ($8.74) @Target. I love weekend looks because they present a combination of casual & chic. If you’re going to a B&B, traveling to a vineyard for a four-day weekend, or reading a good book & drinking hot chocolate, layering cozy separates in lightweight fabrics can transform the way you enjoy your down time. SHOP: leggings ($10.00) @H&M, blouse ($19.99) in pink @MANGO, cardigan ($12.95) in black @H&M, ballet flats ($11.99) in black @Wet Seal, tote ($21.00) @Shoptiques, stud earrings ($6.93) @Express. Do you dare to wear floral leggings? How do you like to style them? Would you wear floral leggings on a date or to work? For more stylish posts, check out Megan Fox & Felicity Jones’ latest red carpet looks, Viktor & Rolf’s Spring 2015 Couture collection, how to wear the fringe trend for spring inspired by Scarlett Johansson & Heidi Klum, Rosie Huntington-Whiteley’s street style for less, & affordable ear cuffs & front to back earrings from Nasty Gal & River Island. Happy Styling! This entry was posted in Accessories Access, Basics for a Bargain, Luxury Look-Alikes For Less, Quickie Darling Deal & Steal, Show Me The Shoes, Splurge or Save?, Style Darling Daily and tagged 6pm, Accessories Access, affordable fashion, Aldo, Basics for a Bargain, Bluefly, boohoo, Chic Nova, Express, Fabulous in 4 Ways, fashion, floral leggings, Forever 21, H&M, JC Penney, knee boots, leggings, Look of the Day, Lord & Taylor, Luxury Look-Alikes for Less, Mango, Nordstrom Rack, outfit of the day, Quickie Darling Deal & Steal, Romwe, Shoes.com, Shoptiques, Show Me The Shoes, Splurge or Save?, spring style, stud earrings, style, Style Darling Daily, style for days, suede bag, sweater, Target, Wallis, Wet Seal. Bookmark the permalink. ← Runway Rundown: Alexandre Vauthier’s Spring 2015 Couture’s Collection!